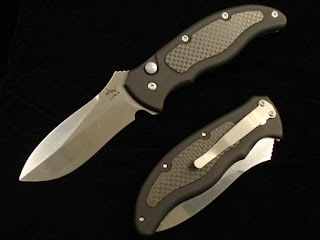 We just got a two different styles of the MercWorx Latalis auto knife in stock. These are extremely nice, handmade automatic knives. The “fit and finish” as I like to call it, is top notch. I especially like the carbon fiber inlays. They really pop out against the aluminum handles. The blade shape on the Latalis is a great shape for heavy duty work. It reminds me of the old Roman small knives they would carry for close in work. This is a large, heavy duty automatic knife. It has good action and locks up very tight. It is definitely a knife you should look at.